Winter is here and most Farmers Markets are closed for the season. For a lot of growers, the cooler seasons are a time for planning and reflection and learning from the successes and mistakes of the growing season. This past year my family and I ran a market booth we called Sulphur Springs Truck Patch. 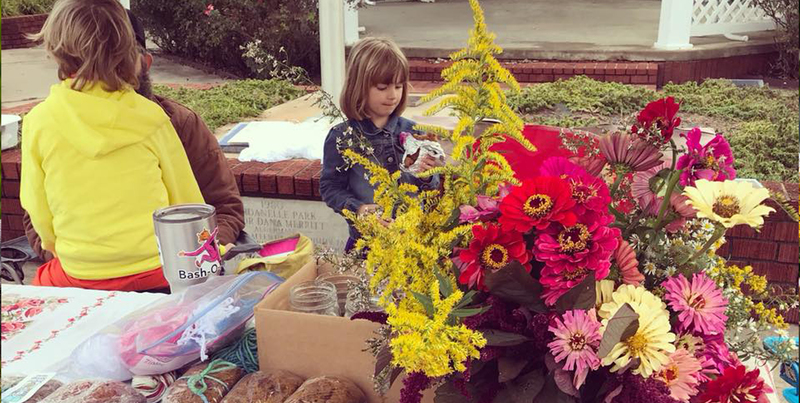 We sold veggies, eggs, baked goods, and fresh cut flowers at the Dardanelle Farmers Market located in the gazebo in downtown Dardanelle. It was our first year to run a booth, and it just so happened that it was also the first year for the Dardanelle Market. I’ve spent over a decade shopping at markets from here to Oregon, but this was the first time I’ve ever been privy to the inner workings of growing for market or watching a market develop from the ground up. In the spirit of this time of abundance and reflection, I’d like to share a few things I’ve learned this past season. I’d say there are three main factors that made the first year of the Dardanelle Farmers a success: commitment of vendors, commitment from the community, and peer support within the market. It’s not easy to get a Farmers Market up and running. Arkansas seasons are notoriously fickle, and it’s impossible to say exactly when something will be ready to harvest. Likewise, most market vendors are not full-time growers and have at least one other job, sometimes three or four. Vendors are almost always pushed for time, fitting market work into their already busy lives. And while it’s true market vending — with proper planning and strategic marketing — can bring in a decent supplemental income, no one is in this business to get rich. The hours are long, the labor is intense, and the income waxes and wanes.Our market vendors believe in honoring the land and the community with their labor. And they show up to share their love with the community. The second factor is support from the community. In an age where we are all accustomed to going to Walmart and finding a wide and cut-rate selection of just about anything, getting investment from the populace can be tricky — especially people who don’t know or don’t care to know about growing seasons or the cost of materials. But at the Dardanelle Market we have been abundantly blessed with people who showed up week after week, ready to spend their hard-earned money to support this community resource. Oh, sure, we have had a few angry folks who don’t understand why you can’t find local watermelons and okra in May or why a late spring freeze can set you back months, or why a hard rain can ruin your tomatoes. But for the most part, our customers are committed to making the market thrive. They show up weekly, money in hand, because they know the success of the market depends on the commitment of the customers as much as it depends on the growers. I’ve seen folks come and buy something from every vendor because they believe in what we’re doing. I have been incredibly impressed by these customers, have come to know them by name, and am full of gratitude for the belief they show in us vendors. Vendor commitment and community support alone can’t make a market thrive, at least not for the long haul. As we all know, some of our most grand creations crumble from the inside. And that’s why I think support within the market community is so essential. I grew up in Dardanelle, but until last year I’ve called other towns home. Moving back and discovering the market community has been transformative for our family. Most of us didn’t know each other before market. But now we know each other by name. We shop each other’s booths, often demanding one another to take our money without discount because we know the hard work that goes in to creating our products. If we don’t exchange money then we engage in creative trade, one of my favorite parts of the market. I love shopping for baby presents at Cary’s Custom Crafts, picking up some goat soap from Delinda Viney Creek Farm buying honey from Rural Route Farms, or a bag full of pears from Bowman Farm. At the end of market if we have things left over, we hand them out to one another, engaging in creative trade. Sometimes I go home with Vern’s banana bread, or a scone from Phyllis at Pleasant View Farm, or some doodle bite dog treats for my dogs from Four Dogs Bakery. We encourage our customers to shop other booths. And thanks to our market manager Delinda LaRue’s savvy recruitment and dedication, selection has expanded to encompass everything from fresh fruit to homemade liquid soap. I know when someone comes looking for okra I send them to Rusty at Mill Creek Farm. If someone needs muscadines I tell them to go see Brittany at Deacon’s Ranch. If they’re looking for sweet and salty kettle corn or tomato seedlings, I tell them to go see Mrs Linda and Sharon at Homegrown and Homemade. Some of us have small children, and these kids have become a community unto themselves. When they’re not helping out at our booths, you can often find them playing under the gazebo or hanging out at another market vendor’s booth, helping them make sales (and sometimes asking for their third sample of candy). My daughter looks forward to market day each week so she can run with the big kids, and my sons helped me run the booth, earning money the entire summer for their efforts. Some weeks there is music, and there’s always lots of great conversation, and the meeting of old friends. Our customers represent people who have lived in the community for generations and recent immigrants alike. And we’re working on making sure all our advertising and information is available in both English and Spanish so we can reach out to everyone in the community. Often times are customers are gardeners, too, and we swap stories of what makes for great soil, where we buy our seeds, and what are the best kinds of mixers for making bulk baked goods. At the root of this community space is the respect we feel for one another. It’s the strongest glue. So now that winter is finally here, I just want to say thanks to everyone who believes in what we do. I can’t wait to see where the Dardanelle market is in five years. And let me close with a friendly reminder: every dollar you spend at a local market is amplified throughout the community. Studies show that when you shop at a chain store about 14 percent of your money stays local. When you shop at a local business about 48 percent (or more) stays local. Want to see a stronger community? You can start with your own commitment to the place we call home.